We are sad to announce that Sen Sen has been discontinued by the manufacturer and our supply is sold out. We are disappointed too. Sen-Sen is the original breath freshener. They are small hard pieces with a licorice flavor. Sen-Sen was developed in the late 1800s by T.B. Dunn and Co., perfume dealers in Rochester, New York. According to Dunn’s history, a plant supervisor by the name of Kerschner developed a formula for an effective and refreshing breath perfume. In keeping with its perfumery roots, it was on the market list for many years as a cosmetic. 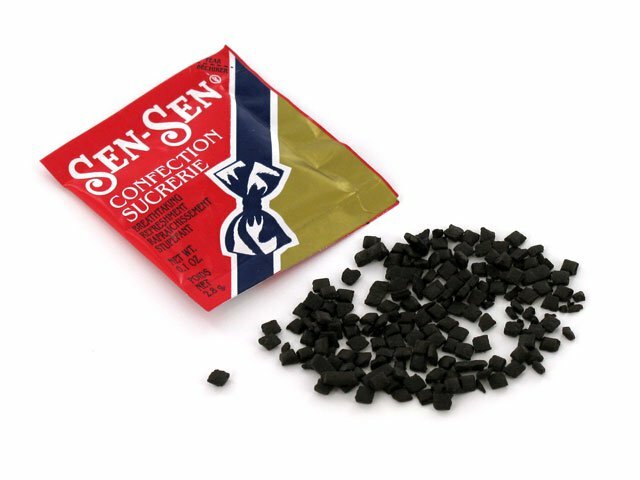 Sen-Sen was to the 19th century what breath mints are to our time. Any country store worth its salt, prominently displayed a box of the handy little packets within easy reach of its customers. The origin of the name Sen-Sen is apparently lost to history. In all the documents that were received at the sale of the company, none mentioned how it’s name originally came about. In Japan "sen-sen" means glistening, shiny or bright, but there is no documentation to indicate any connection between these meanings and the product. The ingredients of Sen-Sen are imported from Bulgaria, France, Turkey, Greece, Italy and some almost inaccessible regions of Asia. The product is still made on some of the original equipment that manufactured the product in the late 1800's.